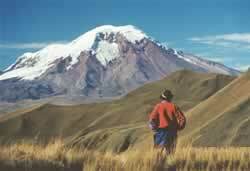 Ecuador is the smallest country in the rugged Andean highlands, Ecuador is among the most rewarding travel destinations in South America. With its array of vibrant indigenous cultures, well preserved colonial architecture, otherworldly volcanic landscapes and dense rainforest, it packs its perimeters with more points of interest than many countries twice its size. Ecuador is a South American country bordered by Columbia in the north, Peru in the south and east, and the Pacific Ocean in the west. Ecuador has a land area of 276,840 sq. km. Galapagos Islands also form a part of Ecuador and is famous for their wildlife. Ecuador has a coastline of about 2,237 km. This country has a republican form of government, and Quito is the capital city, located at an altitude of 2,820 meters. The Ecuador has territories in both the Northern and the Southern hemispheres. The country is geographically divided into the Amazon, the Highlands, the Coast, and the Galapagos Islands. Ecuador's coastal region (the western lowlands) is made up of fertile plains, rolling hills, and sedimentary basins traversed by a plethora of rivers that rush from the heights of the Andes to the Pacific Ocean. All five coastal provinces, encompassing 640km (398 miles) of coastline between them, have attractive beaches and plenty of hotels and resorts for tourists. The Andes mountain range crosses the country from north to south. The Amazon Region can be geographically divided into two sub regions: the High Amazon and the Amazon Lowlands. The Highlands is comprised of the Andean foothills which slowly descend towards the Amazon River Basin. The Napo, Galeras, Cutucú, and Cóndor ranges are located here. The most impressive elevated regions of this area are in the north and include Volcano Sumaco. The Lowlands, found further to east, are home to some of the nation's most beautiful and important rivers: the Putumayo, the Napo, and the Pastaza. The Archipelago of Colon (commonly known as the Galapagos Islands) is made up of 13 main islands, 17 islets, and dozens of ancient rock formation. Apart from its beautiful beaches and unique and varied ecosystems, the Galápagos Islands are home to towering active volcanoes. Ecuador’s climate varies from one region to another, due to differences in altitude, proximity to the equator and proximity to the Pacific Ocean, etc. Each region has a very different climate. The Ecuador has two seasons, wet and dry, but local weather patterns vary greatly depending on geography. The country has several different kinds of terrain, and therefore, climates. Most of the interior and north of the country is high and mountainous, with moderate, dry temperatures in the Summer, but cooler during the rest of the year. The eastern and southern parts of the country are mostly rainforest, and are generally humid and wet most of the year. The driest, warmest months in the rainforest are December, January and February. The western part of Ecuador is coastline, and is much dryer and warmer than the interior. During July, when we visited, the temperatures were very pleasant, but quite wet in the rainforest. Copyright © - Perupicchu.com - All rights reserved.